I’ve been talking about wanting to see the numerous holiday illuminations in Tokyo relentlessly. Dave had a great idea. Let’s do a MariCar ride around Tokyo and check out the Christmas lights. Brilliant! The wardroom is SRF set the date for Friday, 12/15 at 7:00 pm. Perfect for seeing lots of people and holiday lights. There were 8 of us plus the two guides. Keeping with the Mario Cart theme, Dave and I picked Mario and Luigi costumes. Friday was pretty chilly. Fortunately, our costumes allowed for plenty of layering. I stuffed my inside and outside pockets with hand warmers and put warmers in my boots. I stayed toasty the whole way. The ride took us around the middle of Tokyo. 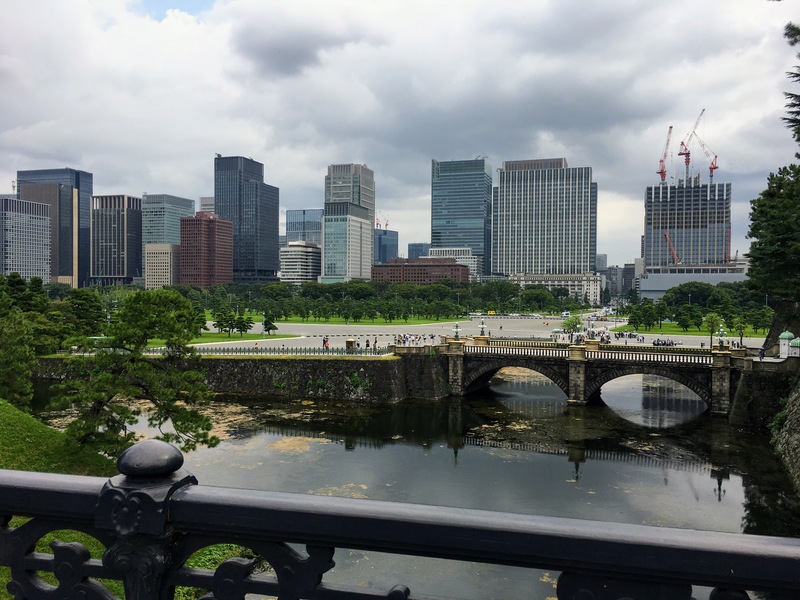 The sights included Ueno, Ginza, Tokyo Station, Asakusa, and Tokyo Skytree. So much fun for only ¥7000 – $70.00. This was a different course than I rode last year with Dina. Plus, before we rode the course during the day. Nighttime would be a new experience! Here are a few shots from along the route. Seeing Tokyo Skytree was really cool. We saw it as we approached and then stopped for a group photo. 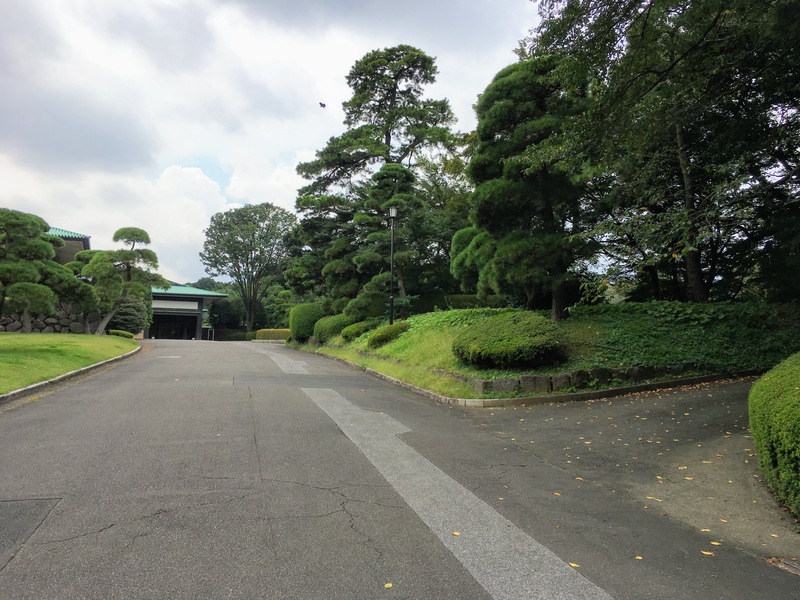 Here are a couple pictures of the trees around the Emperor’s Palace. From Asakusa- Kappabashi- Kitchen town. The highlight was waving as we were stopped at lights. It was easy to make people smile. Dave and I had so much fun. It was a little scary at first and when you go really fast or hit bumps. But, it’s super cool and fun. We talked about who in our family would love this the most. We agreed his brother Bob, niece, and nephew – Jade and Jordan would absolutely love the experience. I hope we can go during your visit. Here is what you need to do in order to participate in MariCart when you visit. I took a screen shot of the website. Basically, you need an International Driver’s License. You obtain that and I will make our reservations. Keep in mind, you’re allowed to wear your own costume. Dave suggested next Christmas season we dress as Santa and his elves! 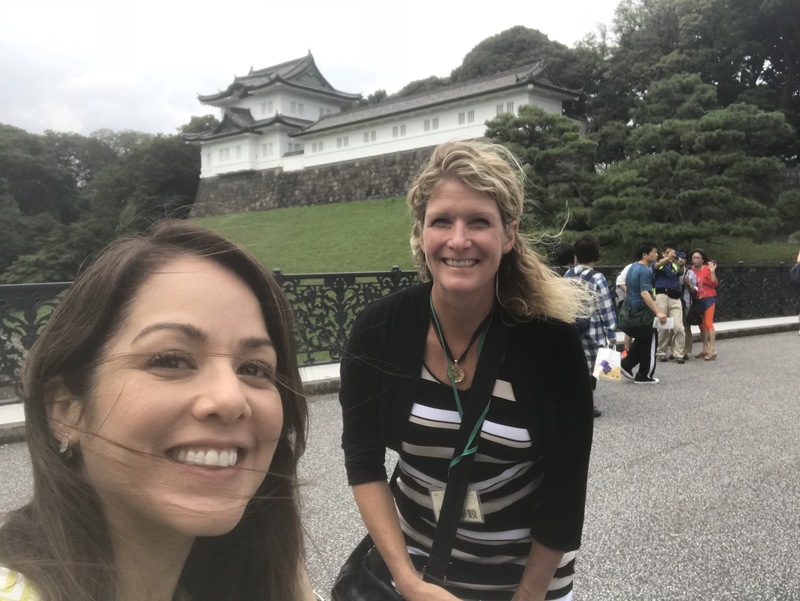 Sonia was able to register us for a guided tour of the Imperial Palace Grounds. The East Garden is free and open to the public. (I made a note to come back and visit this part next month when the leaves are changing.) 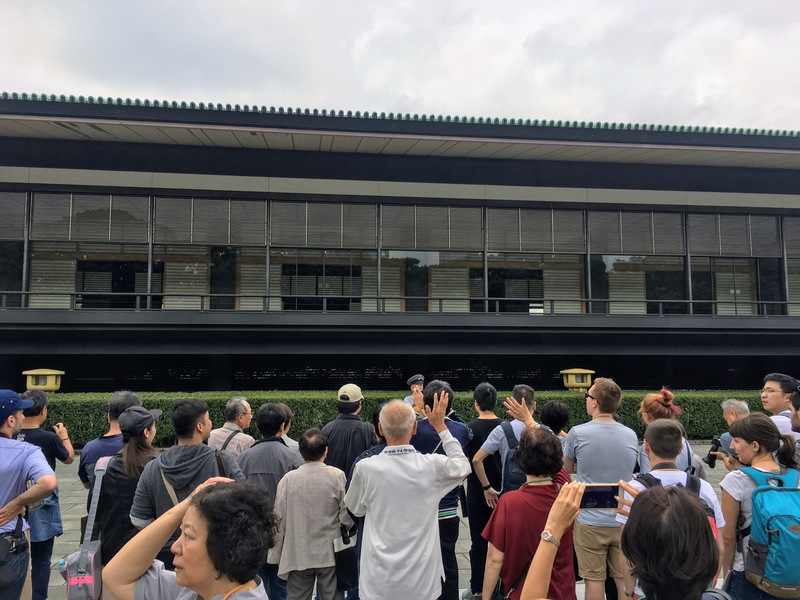 The part of the grounds we toured are only open to registered guests on a daily basis and the general public on the Emperor’s Birthday and the second of January. The guide spoke only in Japanese. Fortunately, there was an App we could download that provided both audio and written descriptions of the significant parts of the tour. It was not as entertaining as the English guide at the Kirin Factory, but just as informative. 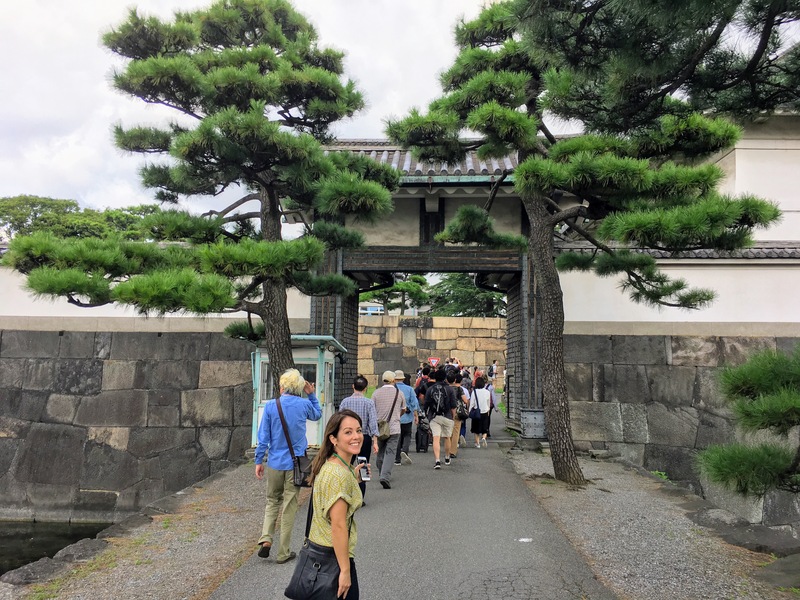 Before I begin with the details of the tour, let me take a minute to share details of the Imperial Palace. Tokyo became the official Imperial capital in 1868 at the end of the Edo Period. 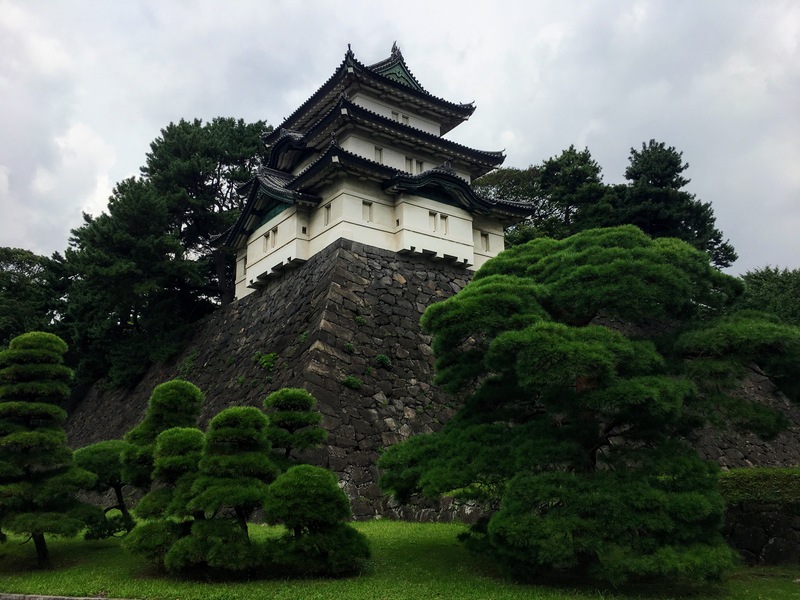 The former Imperial capital was Kyoto. 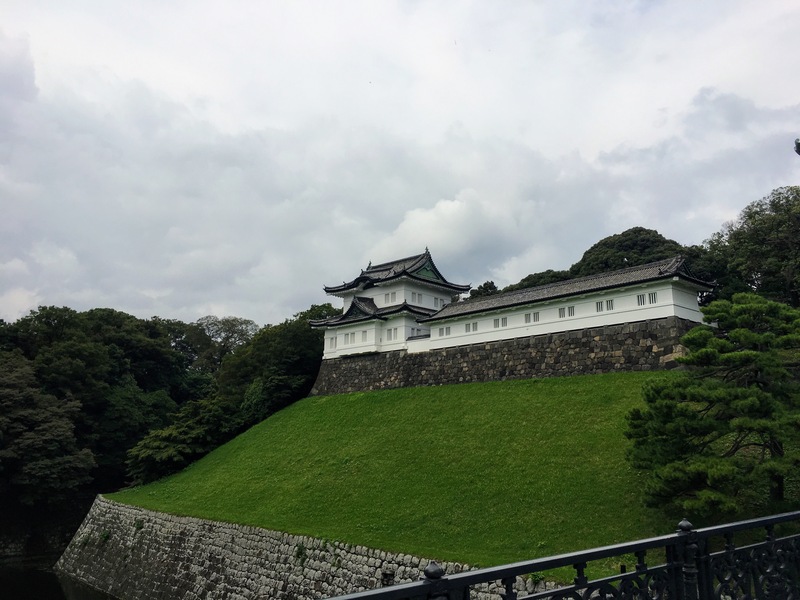 The original Imperial Palace in Tokyo was destroyed during Workd War II bombing raids. Only a few of the traditional buildings remain. 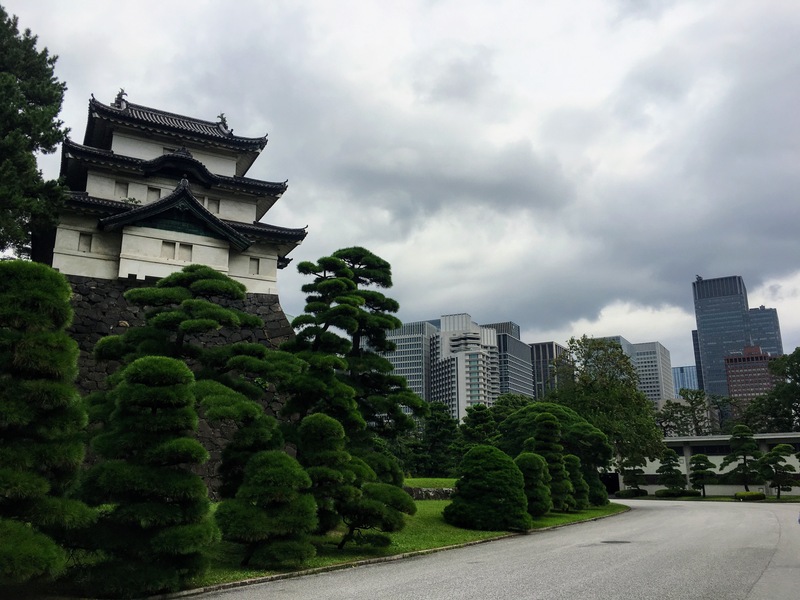 The Imperial Palace grounds include about 1,150,000 square meters or approximately 284 acres in the middle of Tokyo. It is surrounded by a moat and rampart (stone wall) with eight gates. 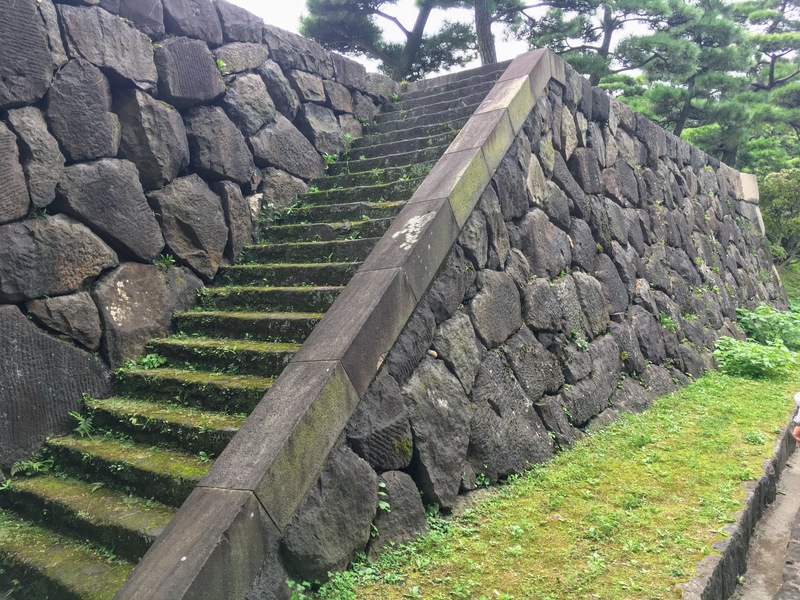 To access the start of the tour, we were required to use a special entrance – the Kikyo-mon. We arrived about 30 minutes early and were united with a large bus group. The tour consisted of about 200 people. 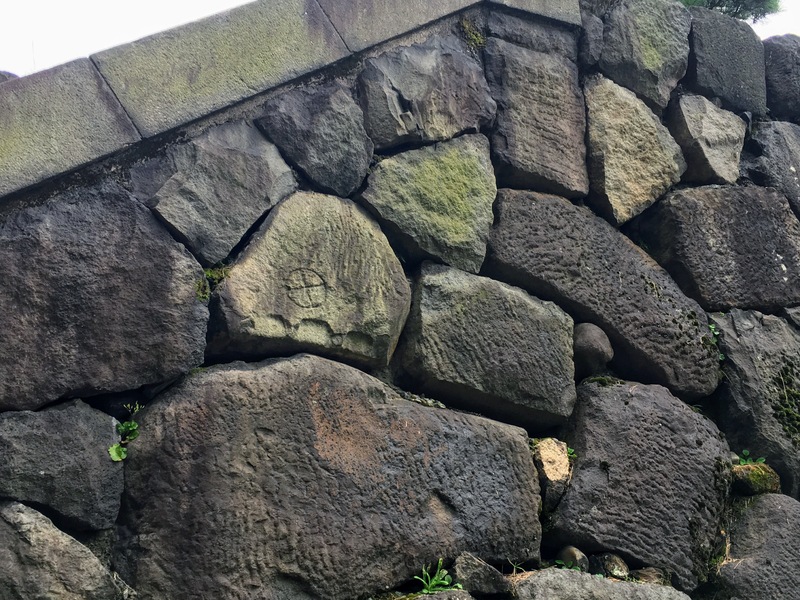 As we began the tour, we passed a large rock wall, known as the Kikyo-mon Stone Wall. The wall provided security and protection. Also, carvings are present signifying the family crest of the worker who helped build the wall. These carvings exist on all the stone walls surrounding the palace grounds. 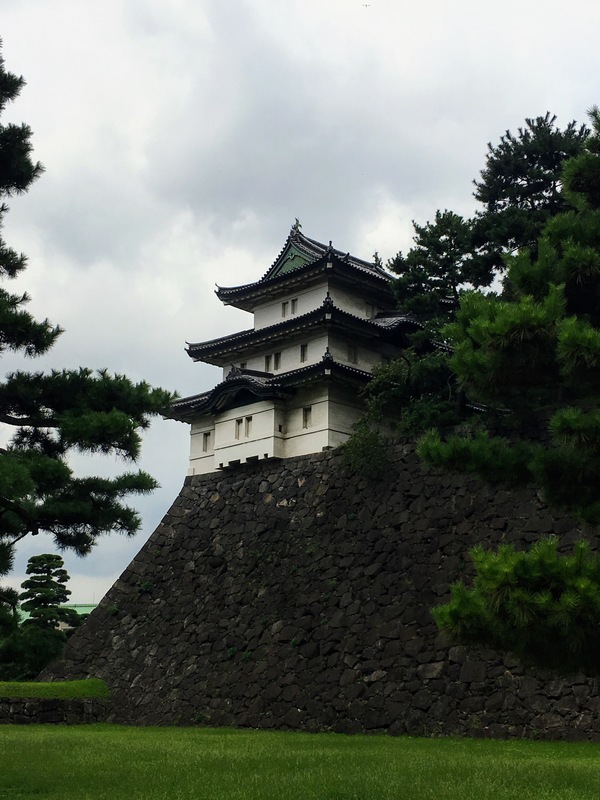 The Fujimi-yagura watch tower was reconstructed in 1659 and one of the oldest remnants of the Edo Castle. The rampart is approximately 15 meters high and the watch tower is 16 meters high. Notice the beautifully manicured trees. The style is “niwaki” meaning “garden tree” because they resemble clouds. The Fujimi-yagura tower was given this name because before the skyscrapers were built, Mt. Fuji was visible on a clear day! 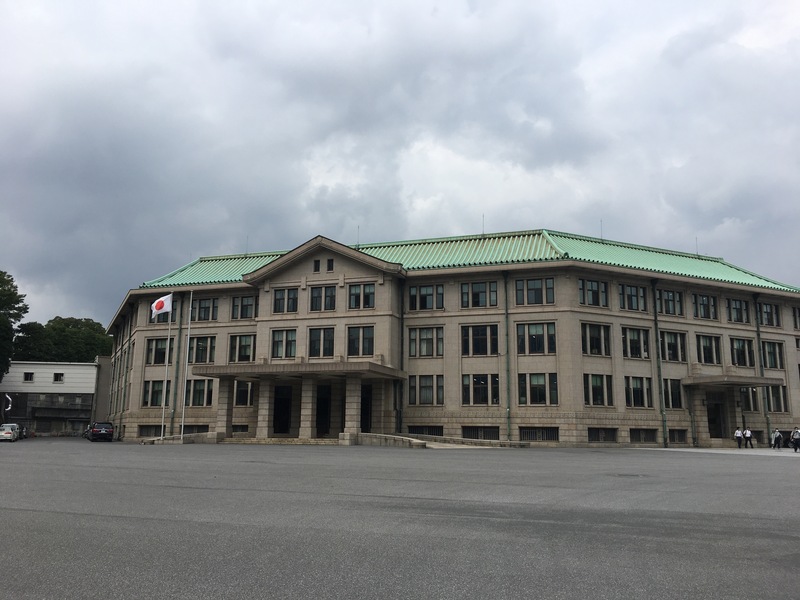 The next building was the Imperial Household Agency Building. It was constructed in 1935. 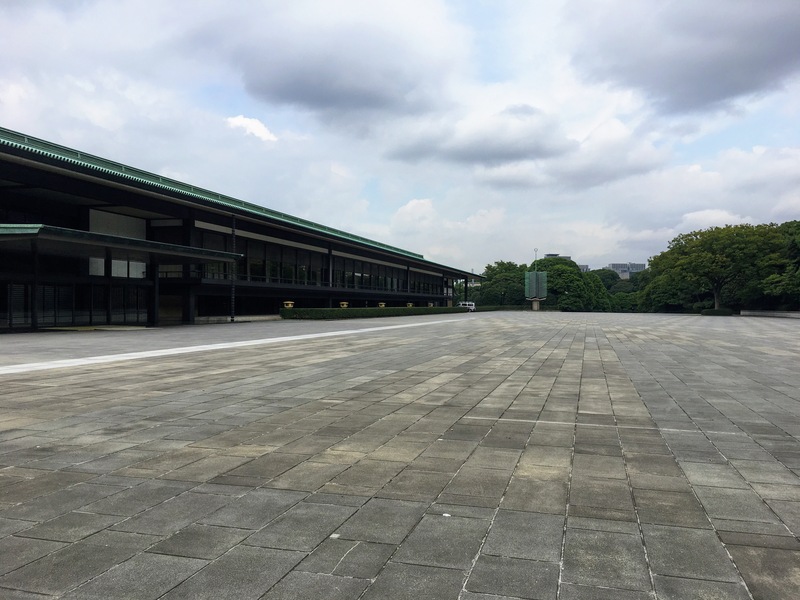 After World War II, the third floor was used at the Imperial Palace until the new palace could be built. 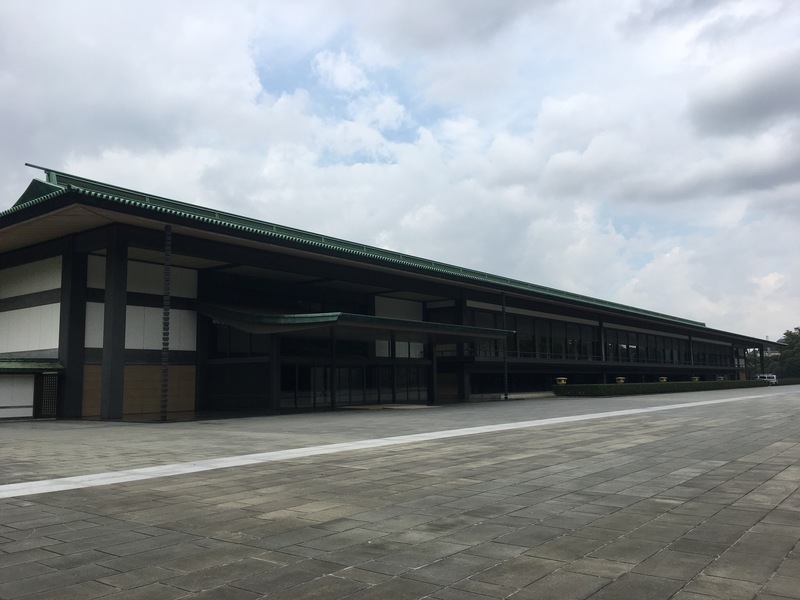 The Palace East Courtyard or Kyuden Totei, consist of a large courtyard in front of the Chowdan Hall of the Imperial Palace. 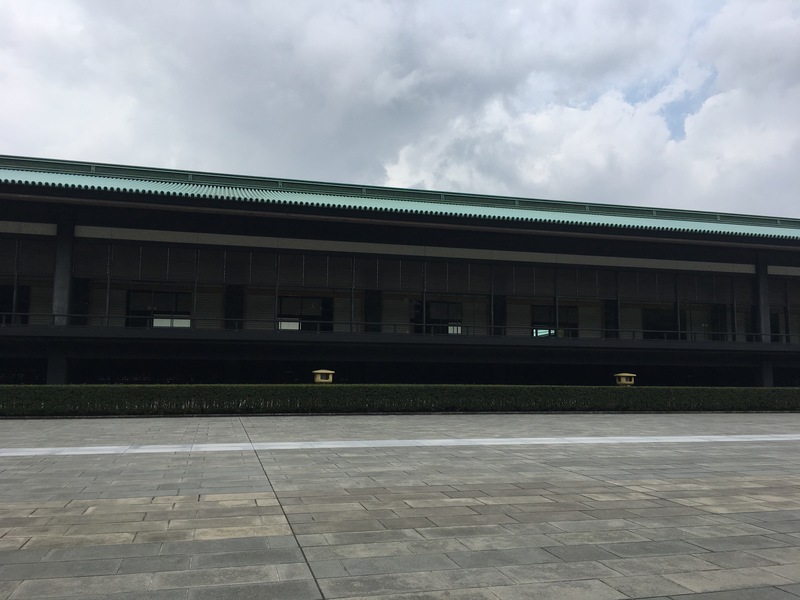 From the balcony, the Emperor and Empress will greet the public twice a year. The plaza was HUGE! 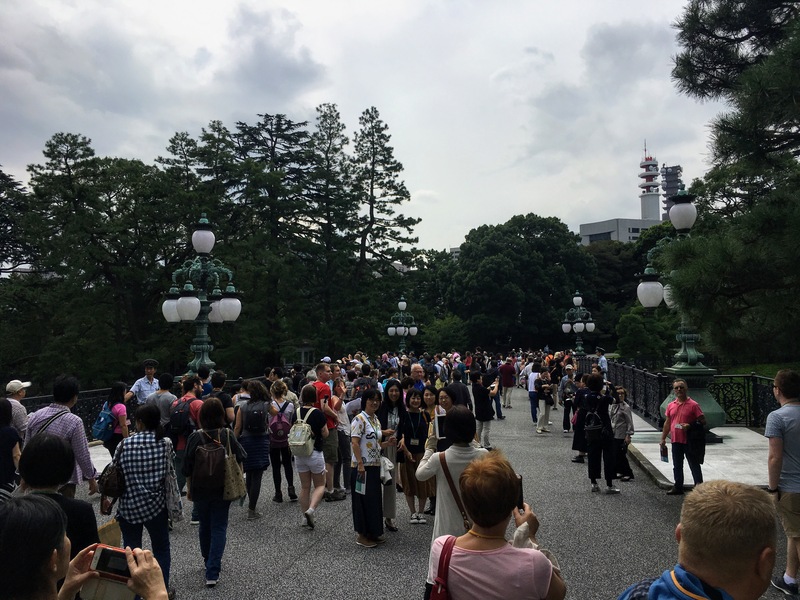 When open to the public, crowds of 20,000 gather to view the Emperor and Empress! As a group, we pretended to wave to the official party. The stones in the plaza are “softer” than normal. In case someone should fall, their injuries should be reduced. The Seimon-tetsubashi Bridge is a highly praised and loved bridge. 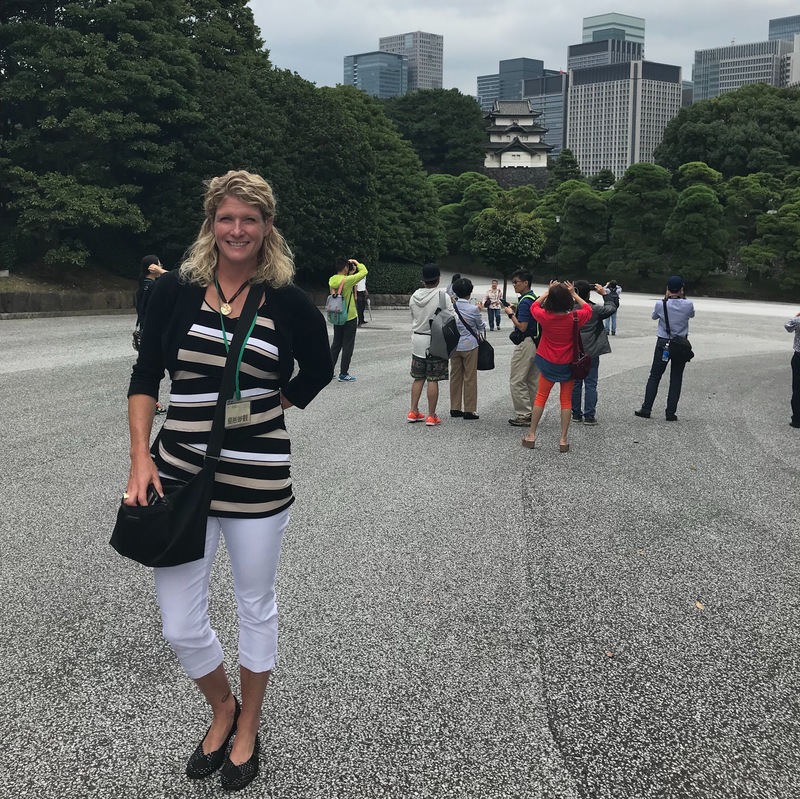 The views of Tokyo were magnificent! 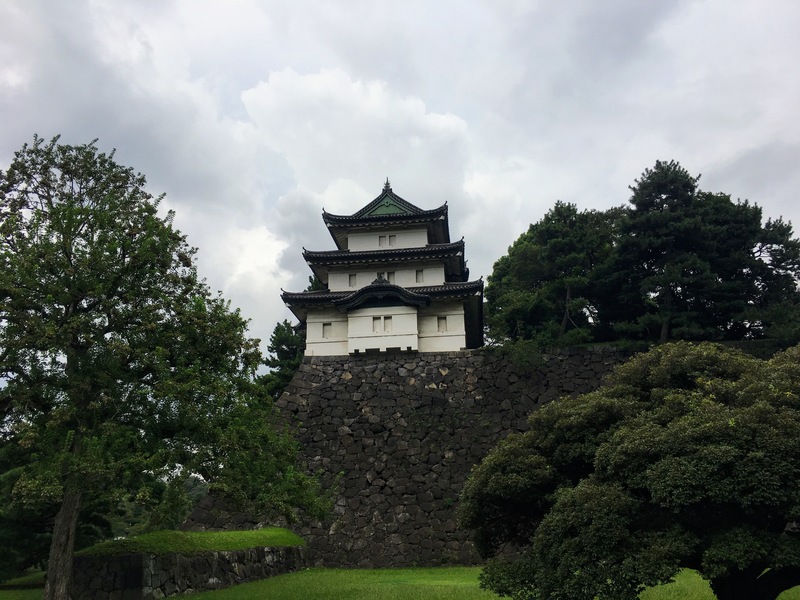 The Fushimi-yagura tower is one of the most iconic of the Imperial Palace. It is believed to have been moved to Tokyo from Kyoto during the 17th century. 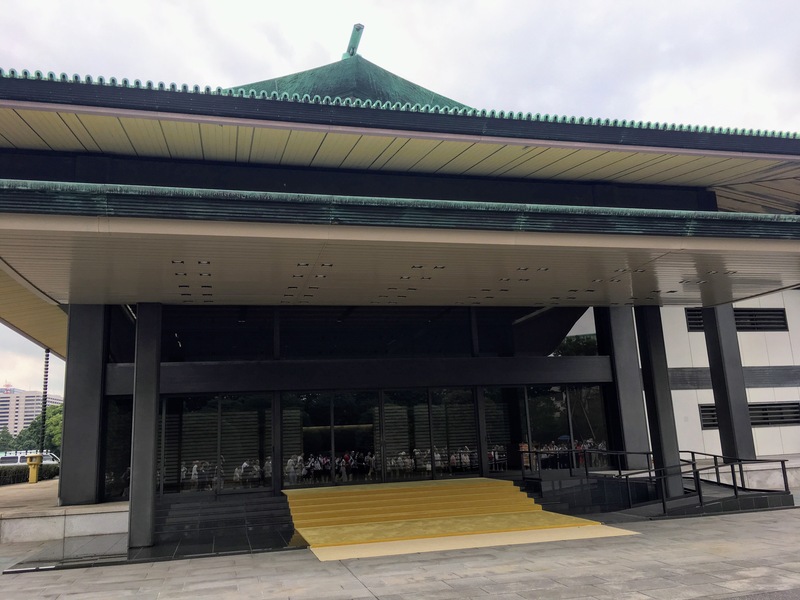 This large entry and stairway is where the Emperor will greet official guests to the palace. The remaining part of the tour took us down several beautiful tree and mosquito lined streets. We came away with lovely pictures and not so lovely bites on our ankles! 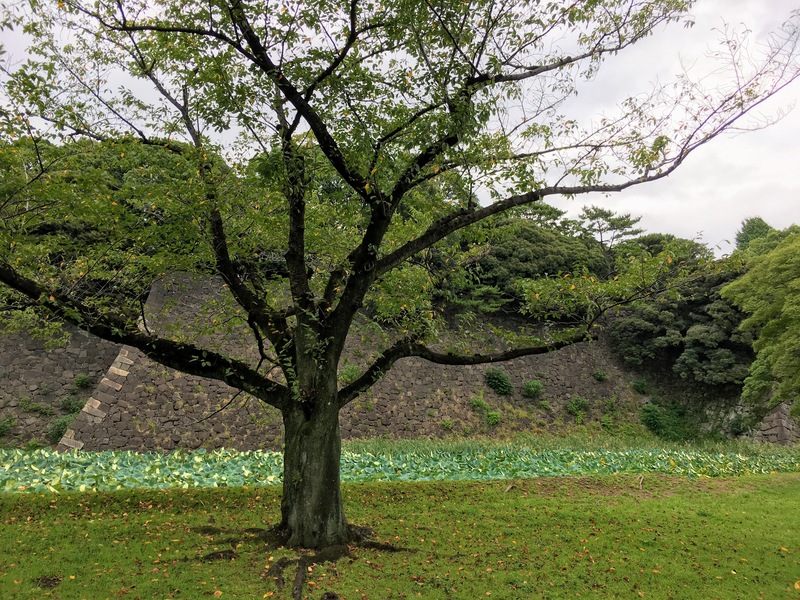 The moat is behind the large tree and in front of the stone wall and full of lotus plants! It was a very cool tour and experience. I was very appreciative of Sonia for arranging it and inviting me. 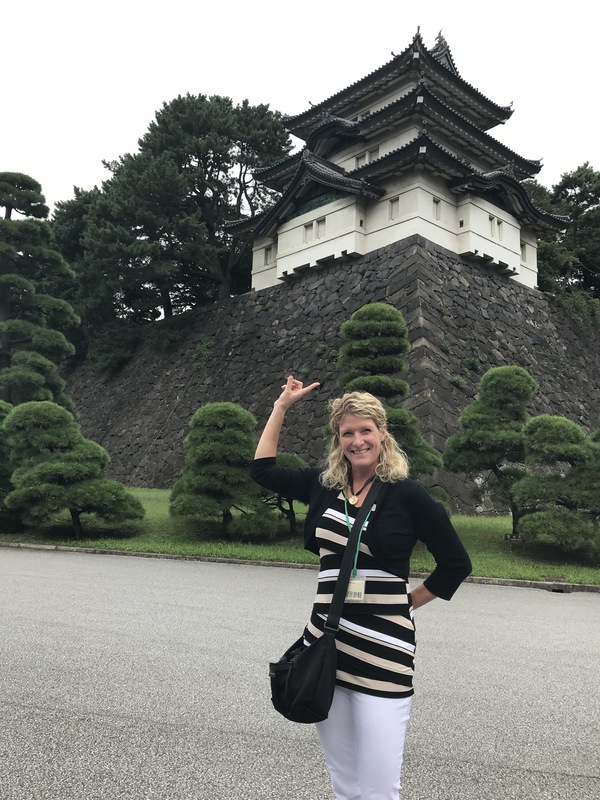 I will look forward to returning next month and visit the East Gardens of the Imperial Palace when fall finally arrives and the leaves start to change. I’ll probably skip the New Years event. The thought of 20,000 people in that plaza kindof stresses me out. Not to mention the crowded trains to get there! !